In the past few episodes we’ve really run the gamut on products, and today, we’re bringing that to the forefront. 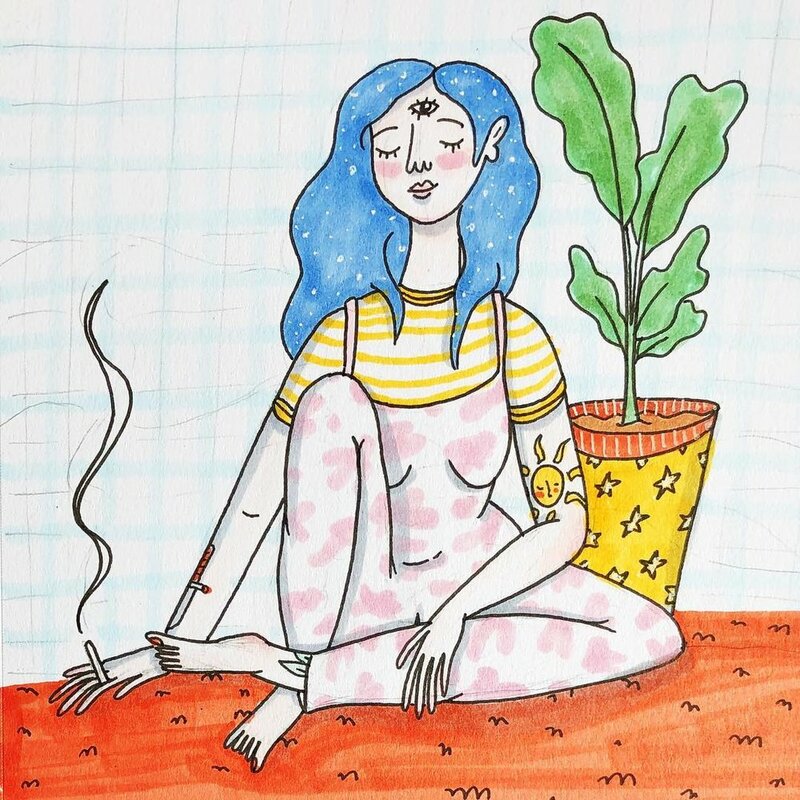 Introducing Sarah Day, illustrator and product queen. Learn how to take those first steps in figuring out what is going to make a good product that sells. That way you don't waste a bunch of money on something people don't even want. Tell us about yourself, what’s your story? I went through a quarter-life crisis, which, in turn, set in motion this ambition to pursue illustration. And so, I made the conscious decision to transition from being a musician and elementary school teacher to an artist. It was only after the first year or so that I really started to ease into the role of being an “artist” and feeling comfortable within myself to be able to claim this title. It was honestly just a matter of having the balls to continuously declare myself an “artist” because no one was going to do it for me. Eventually, I believed the words that were coming out of my own mouth rather than simply saying them for the sake of keeping up appearances. 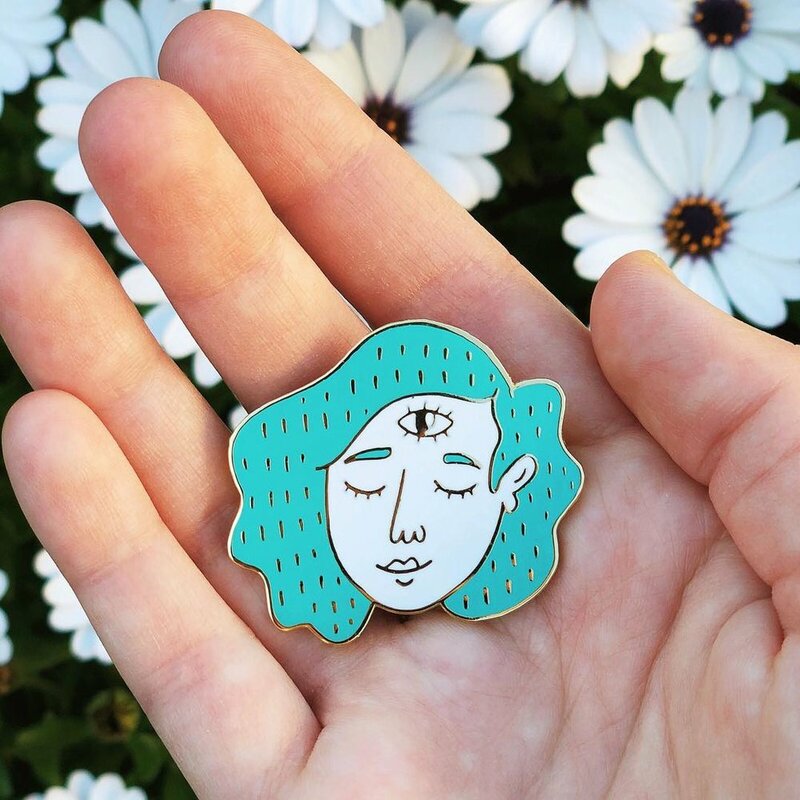 What made you decide to start creating products from your art? It was the enamel pins, they’re like toys for adults! I just have this love for the miniature and the intricate colors and textures. Not to sound too dramatic, but it awakened in me what my younger self would have felt for a doll house. Around mid-2016 is when I made my first enamel pin. I was totally new to the scene, so in a way, it was also this sense of legitimacy that I was craving that contributed to wanting to make a product. To see a potential fan of my work engage with my creations on a tangible level just excited me! And then to realize that, oh wait, this could also be an actual source of revenue to further sustain me in doing this was kind of the cherry on top. When I look at you, you have such an easily identifiable aesthetic in your work. What’s your perspective in terms of finding a style that you feel is right for you? 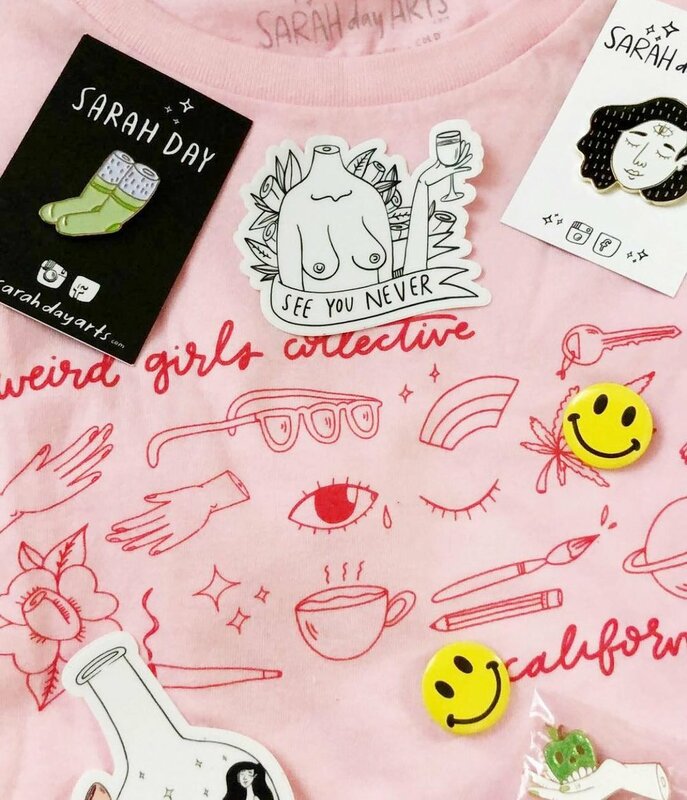 I think Tuesday Bassen is a really good example of someone who found their visual language and, with consistency, built it from the ground up. Her style is her trademark. Even just looking at the artists around me, it became clear that I needed to hone in on what my style was before anything else. Like jeans, you’re most likely going to have to try a bunch on before finding the perfect fit. And when you do, it feels like a good, happy place. Like home. So what would you say to those people out there that haven’t yet found their style? Go ahead and make some products, or press pause and take that time to find their voice? I definitely jumped the gun and started making products before I was comfortable with my own work. So I’ve got merch covering all stages of my development. I am not necessarily going to come down on myself for that, but, there would certainly be times where products I had come to outgrow in terms of style wouldn’t be sold out yet. It just comes down to accepting that part of yourself that is still taking form and allowing it to mature. If you are looking to go ahead in creating a product, regardless of where your work’s evolution is at, perhaps scaling down the production to in-house, or on demand, will allow you to sell at a rate that matches your growth. Say you’re just starting out, have no money, but still want to make something. What would be a good introductory product that doesn’t take a lot of upfront investment? Apart from doing posters and pins, you could look into some handmade items or DIY. Running by your local craft store won’t do you any harm, and you might be pleasantly surprised by the cost of fabric paints/dyes in comparison to that last google search on screen printing! We are also becoming increasingly aware of sustainability and whether or not something has been ethically sourced. You want to have your eyes on your supply chain, and DIY certainly cuts out a lot of the production factors where we might not necessarily have a total overview of what’s going on. On the flip side, it can be a heck of a time investment, so you really need to weigh your pros and cons. If you’re really looking to go all in, I know of Eva Stalinski who does screen printing at home, along with many others. You just need the physical stamina for it! And, of course, we’ve got our third-party platforms such as Society6, Teespring, and the one I personally tried, Cotton Bureau. Even though they don’t have the best profit margins, you’ll still be getting your work out there as a start. How was your experience working with Cotton Bureau? On just a very basic level, if you’re working, or collaborating with someone, and they only want to keep the communication to an email/text only basis, don’t go through with it. As with Cotton Bureau, you’re not going to see any profit until you hit twenty-five t-shirts either. Which, alongside their pricing, was a pretty tough sell. On top of that, I had to re-route my consumers to purchase via Cotton Bureau and not via my own site. Overall, I sold eighteen t-shirts and didn’t make a cent. If you’re going to go into a product, make sure you really stand behind what you’re putting out there and be conscious of your social capital. Rolling out products left and right to simply stay afloat profit-margin wise will just leave your customers with pitch fatigue. Having said this, would you advise people to perhaps stay clear of third-party platforms altogether? It depends on where you’re coming from. If it’s more of a hobby, third-party platforms can be a fun way to see your designs on a mug or a bed sheet. However, if you’re really looking to build yourself up as a brand, I wouldn’t depend on these platforms to be your bread and butter. What do you think goes into making a good product? Ok, so visualize a pie chart. Fifty percent of that should be what your customers need, want and like. Once you’ve defined these elements, factor in what you yourself would like to make. And last but not least, the story behind the product itself, the relatability factor. That magic little somethin’ somethin’ that speaks to your consumer on a deeper level and creates this “need” instead of a “want”. At the end of the day though, be mindful of the balance between your business and your creativity. It’s not simply about selling out, but being able to facilitate the work that you love to do.